My 9-year old son is an experienced traveler who has traveled by plane every year since he was born from our home in Canada to Sweden, Maui, the Canary Islands, and other places. He also has special needs. He doesn't have a clear-cut diagnosis like autism, but he has various issues with learning and speech, and also how he experiences and processes certain sensory input like sounds. It hasn't always been easy for him to travel by plane. Don't get me wrong: he loves planes, but being on a plane is a little different than looking at them from the outside. There's a lot of travel-related stress, and there are strange noises, sights and smells on board. Airports are also strange places: big and busy, full of places where you either have to rush, or wait around for long periods of time. All of this can be, and has been, challenging for him. He has overcome the challenges however. Once upon a time he was extremely anxious and fearful on flights. Any noise from the plane would make him hang on so tightly to my arm that I could barely move. There were times when he refused to put his seatbelt on because he was so scared. Those times are mostly over. 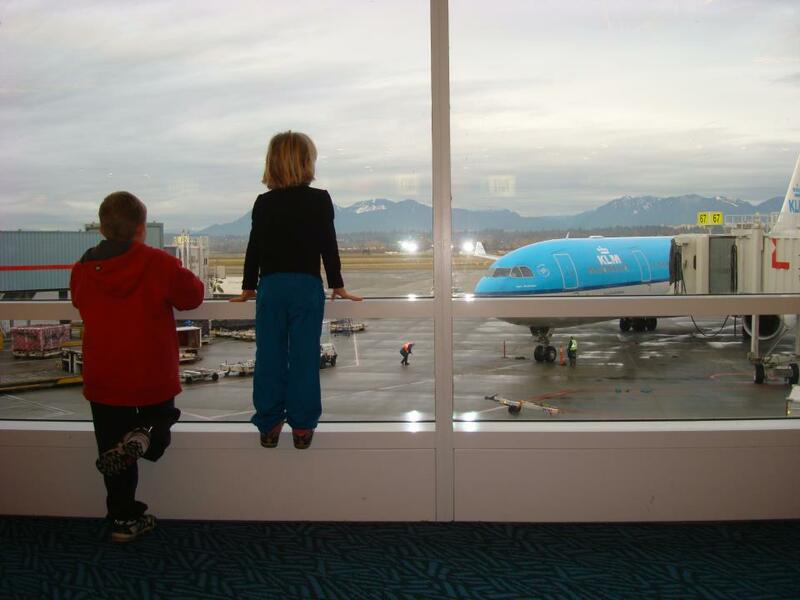 He now knows what to expect on board, and at the airport, and that makes things a lot easier for him. Over the years, as I've watched my son and learned from him, I've tried to better understand how he experiences travel-situations. Based on that, I've tried to use various strategies to help him cope with the stress of travel. After having my second child, I've also realized that many of these strategies can be helpful for any child, whether they have special needs or not. 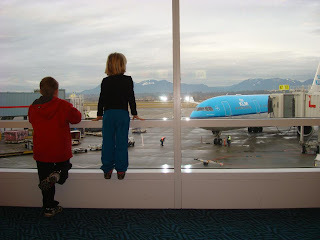 All these tips are very personal, and I know that each child, and each child with special needs, is unique, and each family will find their own way to make airplane travel easier for them. My son handles any activity a lot better if we prepare for it ahead of time. We talk about the trip in general for weeks (and months) ahead of time, and we also talk about each step of the trip in detail. This means talking about in what order things will happen: first we go to the airport, then we park the car, then we go to the checkin counter, then we go through security, then we wait at the gate, then we get on the plane, then we get off the plane, then we go to the next plane, or wait for our luggage. And so on. This might all seem like too much (my daughter sometimes gets annoyed with this detailed walk-through), but my son likes to know exactly what is going to happen, and in what order. These days, the walk-through is somewhat less detailed, and he doesn't need it to be repeated as frequently as he did when he was younger, but he still likes to go through the steps. What worked for him in this instance was that we read books about airplanes, and that we learned about what those noises meant. Then, once we were on board, we could name the noises and talk about them: that's the wheels going up, that's the wing-flaps changing position, that's turbulence ("bumpy air"). Knowing what is causing the sounds makes it easier for him to cope. Using a visual planner to show the different steps of the trip can definitely be very useful. I haven't used one for my son, but I think if I had known about them when he was younger, it would have really helped. These days we count down the number of planes we need to catch when we go to Sweden (usually three), and that helps him. A countdown calendar to prepare ahead of the trip is also helpful to manage pre-travel anxiety and the question "when are we going?". These days, my son also likes looking at the maps on board the plane, the ones where they show how far the plane has traveled and how far it still has to go. Using earplugs or headphones to manage the noise-level on the airplane can be helpful for many kids. Usually both my kids wear headphones and listen to whatever movie they're watching (if they're not sleeping), but if your child is OK with it, noise-cancelling headphones and earplugs is definitely an option to consider. Most kids don't respond well to stress and having to rush or hurry through any activity, let alone something as inherently stressful as travel. For kids with special needs, this problem is often exacerbated. I always arrive at the airport with plenty of time to spare, just in case of long lineups or other problems. (3 hours ahead of an international flight is just fine by me.) It's just easier for my son and the rest of us if we don't have to hustle through the airport to get to the plane on time. In my experience, airline staff are usually very willing to try and help make your travel-experience better. I have mentioned my son's anxiety and special needs-issues to airplane crews at times, when I thought it might cause, or was causing, an issue. If you think you might need some special considerations or help, let the airline know ahead of time, and also mention it when you check in at the airport. Things like wheelchairs, a ride between gates in the little airport cars, or maybe early boarding, can often be arranged for those who need it, but it's good to talk to the airline about it ahead of time. My own anxiety would sometimes get the better of me when I traveled with my son in the past. I worried about him being anxious and in distress. I worried about us causing "a disturbance" on the plane. I worried about what fellow passengers would think and how we might inconvenience them. It can be hard to manage these feelings, but I do a better job of it these days I think. Partly because my son is such a travel pro now, and partly because I've decided that other people can either show him some compassion, or they can choose not to do so. I can't control them, I can only control myself, and help my children to the best of my abilities. I come prepared, and I do the best I can. And that is good enough.